2018 has been a fantastic year for films so far. Not only can this be seen by the incline in the box office numbers, but also by the quality of films that have been released this year. This is also a strong year for variety, as there has been a rise in independent, horror and animated films so far. It is time for me to compile my list of the top ten films, and this was tough for me. So far, I have seen 18 new releases and I missed a lot of the big ones. So, before we get into my list, I do want to point out a few factors. First, I have missed a lot of the Oscar-nominated films, so the likes of Lady Bird and Darkest Hour are not on my list purely because I didn't get to see them. Second, I am going by the UK release date, so films such as Three Billboards and Coco are counted to my 2018 list. Finally, since I live in the UK I have not had the chance to see Incredibles 2 (therefore cannot go on the list yet). I didn't care about Jurassic World and therefore am not going to see the sequel. With that out of the way, let's get into the list (along with a honourable mention and some disappointments from the year). If you are interested in a more detailed review of these films, I will leave a link to my review in each film. This film is hit and miss by a lot of the Star Wars fanbase. It is clear that the general audience aren't interested in this either, given the abysmal box office statistics coming through. Despite all that though, I found this to be a great summer flick that is a nice addition to the Star Wars franchise. Yes, there are some script and pacing issues with this film, and yes I still think that Han Solo could have been casted better. However, there are certain moments in this film that shine and bring out what we all truly love about the Star Wars franchise. 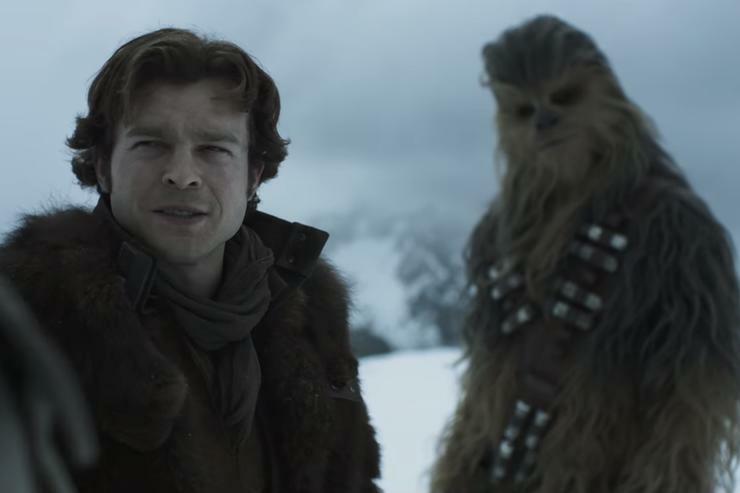 Seeing when Han and Chewbacca meet for the first time is a moment that is very special and something that deserves to be up there in the greatest Star Wars moments. It is a shame the box office for this was low, as it means we may not get movies like this in the near future. Most people may be happy about this, but I wish this film got the recognition that it deserves. I used to be a massive book reader, particularly in the Young Adult genre. This is the perfect fit for Love, Simon, in which the original source was Simon vs the Homosapien Agenda. Whilst I have never read the book, I have heard fantastic things about it and I was excited about the film. To have a lead gay character explore his sexuality and getting comfortable with the fact that he is gay is such a great idea for a film. It lead to people like Neil Patrick Harris and Superfruit to buy out cinemas to let the LGBT+ community see this film, even if they couldn't afford to. The film is exactly like a John Hughes film, with a perfect mix of reality and fantasy. I feel that the story is a little simple, and some of the characters made some weird decisions in my personal opinion However, this is such an important story and representation is vital in this day and age. This is a project that I was excited about right when it was announced, just from the guest list alone. Sebastian Stan and Margot Robbie are my favourite actor and actress working in Hollywood right now, and them being in this film was exciting. I had never heard of Tonya Harding before this film, and I did my research before I went into this film and the whole story is so crazy to me. This was a great film, and Allison Janney's win at the Oscars was so well deserved. I found that this film slightly glamourised the incident, and tried to make Tonya look innocent. I'm not sure if that was the smartest move, given the fact that Tonya deserves no remorse in my opinion. But with the documentary style and incredible acting, this is such a great film. I am a huge fan of Disney and Pixar, in case you don't already know that. However, I feel like Pixar has had their ups and downs recently. Inside Out was great, but I was disappointed in Finding Dory. With this original film though, Pixar finally returned to their top form. Coco for me is the best Pixar film since The Incredibles, and a big step in the right direction for Pixar. This is a beautifully animated tale that tells the story of a young boy and his passion for music. This tells the culture of Day of the Dead in a great way that honours the Mexican culture. I was so glad that this film won two Oscars, as it really deserved both of the wins. This may come as a shock to most people. Infinity War only placed at number 7 on my list? Well, the main reason for this is that this film feels incomplete. This is a two-parter, and maybe when Avengers 4 is released, this film will go up on the list of 2018. However, I just have to look at the film that we have and for me, it has several flaws in it. I also have to remind myself that I was disappointed in the ending. It felt weak, as if they didn't commit. The most heart-touching scenes will not stick around, due to the status of the characters and the upcoming slate of films. Like I said, after next year this film might go back up my list. however, I feel that number 7 is a good place for this film. The first film was such a nice surprise for me. I didn't know much about Deadpool as a character, so to see the tone and style of the film separate itself from other superhero films was a nice change. Therefore, it was great to see that this film is even better than the first one. With great characters, a better story and even more humour than before, this is a great sequel and I hope that there will be a third entry. Yes, there are still flaws. These are particularly with the pacing and the lack of screen time for people such as Terry Crews. This doesn't change how fun this film is overall though, and I cannot wait to get the Blu-Ray and watch this film again and again. This is the best made superhero film of the year by far. I wasn't sure what I was going to make of this film, but it presents itself as a simple stand-alone film and it is so compelling. Black Panther focuses on character development, and within that it truly succeeds. All of the characters are well rounded, and the culture is so strong and powerful that this is a great film for black people to go out and support. This is also one of the strongest villains that the MCU has had to offer. Yes, this is the year of Thanos, but Killmonger is a strong villain and his marks on his skin are a nice touch to his characterisation. The cinematography is beautiful, and the music stands out. This could end up being a strong Oscar contender, and it deserves to do well in the technical aspects. This is the most controversial film of the year, in along with mother! from 2017. Either you love this film, or you hate it. There really is no middle ground. And whilst I can see why some people hate it, or have issues with several aspects, I truly did love this film. Yes, there are flaws. But I just cannot stop thinking about this film, even two weeks after I made the trip to the cinema to see it. This film is incredibly haunting. I was left in shock at certain scenes, as this film was gory and not afraid to show off-putting imagery. This was also cleverly done, and the cinematography was stunning in this film. This has some of the best acting of the year from Toni Collette and Alex Wolff, and I hope that this film can get some Oscar momentum because this film truly deserves it. I have been so excited about this film ever since it was announced years ago. I absolutely loved the original book, and when I heard that this was going to be directed by none other than Steven Spielberg, I knew this was going to be a masterpiece. Yes, this is very different to the book. However, I enjoyed both equally. This is an incredible film, and all of the changes made sense within the context of the film. Being a two-hour film, they didn't have the time to implement all of the smaller details so these changes make sense for the context. This film also has some of the best scenes in any film this year, in particular the scene based on The Shining. I cannot wait for this film to get released on Blu-Ray, as this will be a day one purchase for me. 2018 has been a fantastic year for horror. Hereditary was a great horror film, but my favourite of the year so far is A Quiet Place. This film is one that you had to experience in the cinema, and this is a film that impacted the way people are in the cinema. Even one noise and you were stared at by the audience. This is the impact that this film had, and to remove sound almost entirely could have been a gimmick, but it works incredibly well for this film. You really do cheer on the main characters in this film You are placed in their shoes and wonder who you would cope in their situation. This is a cinematic masterpiece, and I am so glad this film did better than expected in the box office. With a second film coming along the way, it will be a question of where they take this potential franchise. This is going to be the top film by the end of the year. No film is going to be able to compete with the cinematic piece, and this was the film that should have won Best Picture at the Oscars. This is such a powerful piece and such an incredible story, told amazingly by performances from Frances McDormand and Sam Rockwell. This has the perfect balance of drama, whilst managing to carry some comedic elements to it. The ending is a perfect way to end, not knowing fully what the plan is or whether they execute it, but knowing that they are getting closure. This is a real depiction of what happens in real life, and doesn't shy away from the honest and brutal truth. I love this film so much and I am glad that a lot of people love this film just as much as I do. Most of you are going to be shocked with this. Game Night a disappointment? Trust me, I am more sad about this than anyone else. This film was almost meant for me. As someone who loves board games, comedy and murder mysteries, this should have been right up my street. Unfortunately, I felt the board game aspect to be a bad gimmick, the characters to be completely unlikeable and stereotyped, and the comedy to lean towards silly slapstick. This is making me nervous going into Tag, as I really want to like that film and have a mini "game-themed" film franchise go on, but I just didn't like Game Night. Downsizing wasn't necessarily a bad film, but it wasn't the film I wanted. This was my most anticipated film for the winter of 2017/18. I love Matt Damon, and this was such an original concept that looked to have lots of comedy throughout. Unfortunately, Downsizing felt like an environmental preach which lacked in the comedy and about 20 minutes too long. I felt the movie was going in three different directions and whilst the characters were likeable, I just felt the story wasn't executed well enough to be carried by the acting. Do you agree with my list? What is your favourite film of the year? Let me know in the comments below. Just to let you know that I may end up changing my main upload day to Monday, as I have now gotten a job that is scheduled for every Sunday. Monday is just a better day for me to upload now.